Stratfield Saye (VB096) is located west of the A33 with the Berkshire county border along the Roman road to Silchester forming the parish boundary to the north. Originally the parish included Beech Hill in Berkshire until 1868 when that hamlet became a civil and ecclesiastical parish. The parish contains a number of scattered farms and settlements with many of these originating in the early medieval period. Typical settlements are Fair Cross, West End Green and Fair Oak Green. Among the local family names appearing over the years were PALMER, HOLLOWAY, ROGERS and THACKHAM. 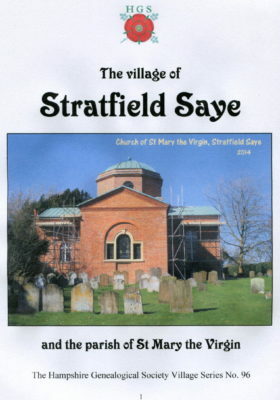 This twelve page booklet includes a great deal of historical information covering Stratfield Saye including not only the gentry but also the teachers, publicans and ordinary people. To assist with your research, useful references for Stratfield Saye documents and records held at the Hampshire Record Office are given throughout, together with other sources and website addresses for more information.